THE STUDIO CAN BE RENTED EVEN FOR ONLY 2-3 DAYS. "The price per day is then: price per week devided by 7". Rural location within a Natural Park. 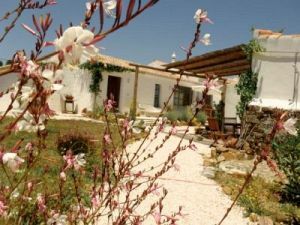 Set in the beautiful countryside in Alfambras, Aljezur area, this traditional Portuguese farmhouse has been converted into a stunning guesthouse in the true style of South Portugal providing the comfort of the modern world. The walls are still made of taipa (mud), and all whitwashed, the roof is handpicked cane, the tiles are hand painted and the floor tiles hand made terracotta from the St. Katarina area. The rooms are light and airy and adjust to the outside temperature, cool inside if on a hot day and warm when the cold outside arrives. The floors have underfloor heating for the colder months (extra charge). There is wireless internet available. Quinta Azul Quarto 1 is one of 3 separate, comfortable and stylish bedrooms with their own access. this one has a double bed and a comfortable bathroom with a big shower. We also can put a 3rd bed in the room for extra charge. There is a shared kitchen available which is fully equipped with 2 fridges, toasters, 4 burner gas hob, tea and coffee facilities, etc. There is also an outdoor seating area with BBQ and sunbeds to relax and enjoy the views. For extra costs we offer breakfast (daily) and dinner if requested by 10 am in the morning. It's a short drive to all amenities. The coastline is unique and breathtaking.The nearest beaches are Praia Vale da Figueiras and Praia Canal, an endless stretch of sand for long walks.There are more beautiful beaches in the surrounding areas are in Arrifana, Monte Clerigo, Praia Amoreira and Amado and Bordeira only a short drive away. 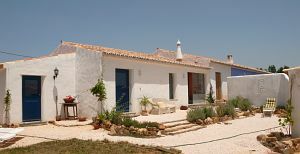 It is also an easy drive to any of the beaches at the south Coast between Portimao and Sagres. Wonderful facilities for walking or biking in the Monchique Mountains.You can enjoy surfing, walking, cycling, golf, tennis and horse riding and much more, there are great towns to visit incl Lagos, a town known for its great night life. We can also arrange Landrover Picnic Saffaris through the Natural Park.